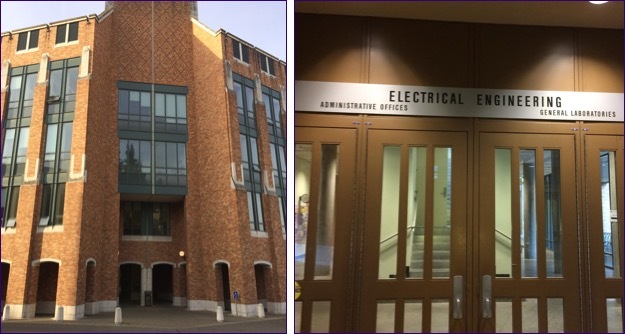 Look for the exterior entrance as pictured on the left, then choose the doors that lead you to the UW EE administrative offices. From there, follow the signs to join us for breakfast! We’re so sorry — we have reached capacity and closed registration for this event. We invite you to still visit campus to enjoy Discovery Days exhibits, and we hope you can join us for breakfast next year! 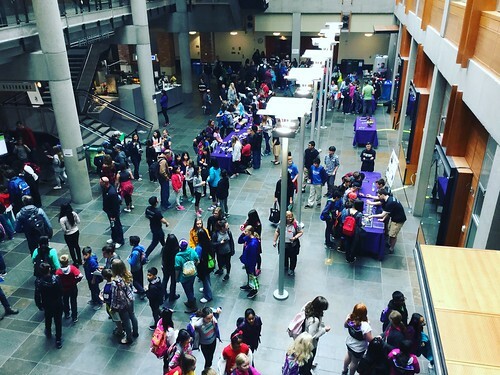 The UW College of Engineering’s Discovery Days (April 21-22) is a great opportunity for students and families from all over the Puget Sound region to join for hands-on activities (like discovering the mechanics behind making a pickle glow and a robot shake hands). The Department of Electrical Engineering will hold an exclusive breakfast for our alumni and their children or grandchildren for a sneak preview of the Discovery Days exhibits before they are open to the general public. It’s a tradition we started last year with great response from the EE community. We look forward to meeting your family at the breakfast. Stop at a campus gatehouse and advise the Parking Specialist that you are attending the “EE Alumni Breakfast” in the Electrical Engineering Department. A parking permit, with the closest available parking lot, will be printed and given to you to display on your vehicle’s dashboard as instructed. If you need disability accommodations, please advise the Parking Specialist. Surface Parking Lots: $5, arrival prior to 12 p.m. (noon) on Saturday. Central Plaza Garage: $10, arrival prior to 12 p.m. (noon) on Saturday. Note: If your visit is less than one hour, be sure to stop at a campus gatehouse as you exit for a prorated refund. Please contact the Transportation Services, Events Office at 206.616.8710 or via email at tsevents@uw.edu if you have any questions or need further assistance with your parking arrangement at the University of Washington, Seattle Campus.